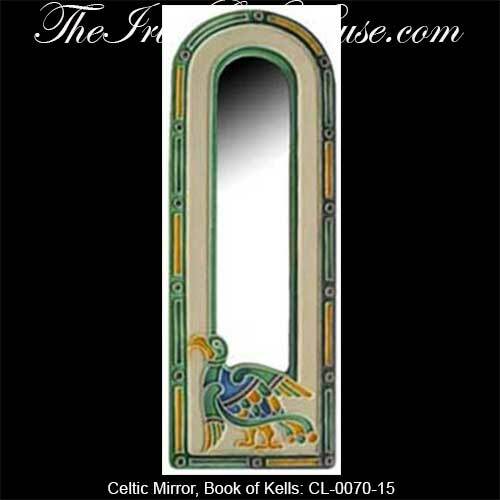 Celtic mirror features a Book of Kells motif with a Celtic bird. Birds were the messengers in ancient Celtic lore. This Celtic mirror features a ceramic frame that is enhanced with a colorful bird design from the Book of Kells. the Book of Kells mirror measures 4 1/2" wide x 12" tall and it is ready to hang on the wall or stand with the attached easel. The Celtic mirror is made in Ireland by Clara and it is gift boxed with a Celtic knot history card, complements of The Irish Gift House. In Celtic mythology birds were said to be messengers from this world to the next, aiding mortals on their spiritual and earthly journeys as servants of the gods.